Teignmouth Sings were very enthusiastically received by a great audience at Bishopsteignton Methodist Church on the evening of Friday 21st November 2014. This was an energetic evening for the Choir, for our Musical Director and for our accompanist ! We opened up again with Big City Beat, a powerful number which went down very well the previous week at the Teignmouth Jazz Festival. Chattanooga Choo Choo was soon rattling down the tracks again to the accompaniment of some genuine American train whistles, and at a more leisurely pace we sang Close to You, Wonderful World and Make You Feel My love. A Capella performances are now a popular part of the repertoire, with our concert featuring Something Inside So Strong, California Dreaming and Ticket to Ride. Big sets included our new Andrew Lloyd Webber Medley, Fiddler on the Roof, Best of Bond and a rousing finale of our selection from Les Misérables, after which the audience demanded an encore… and one enthusiastic person got up to announce that we had sung better than a named TV celebrity’s choir!! Our performance was in aid of charity (see poster) and the collection at the end of the performance totalled £237. A great evening all round! 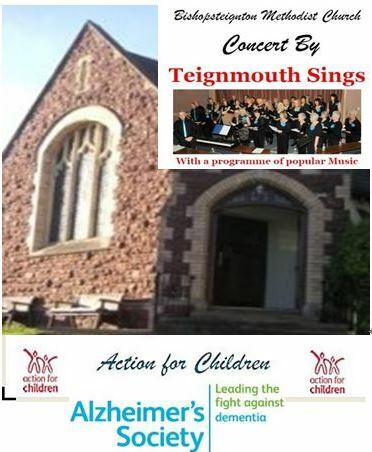 This entry was posted in Events on November 22, 2014 by Teignmouth Sings.